Since Jeff and I are seeing several of the productions in ABT’s 2012 season, I’d got the wild notion that I might as well attempt to see every show they’re presenting in rep at the Met this summer. 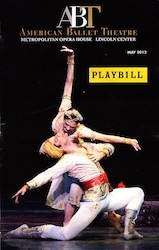 Jeff usually writes these reviews, but wednesday afternoon I went by myself to see La Bayadere. Before I begin, I’d like to say that I know almost nothing about ballet or classical music, though that doesn’t mean that I can’t enjoy the artistry on display. I never really expected to like ballet so much, but I’ve loved everything we’ve seen ABT do. The thing I find most intriguing about dance is the way story is conveyed with movement and music without every uttering a single word. 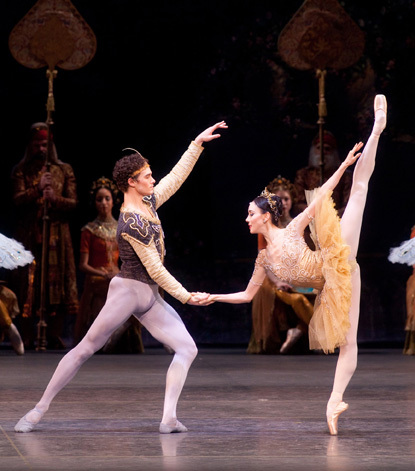 Also, American Ballet Theatre is the preminent classical repertory company in the U.S. The dancers that make up the company, the principals, the soloists and members of the corps, are the best in the world. It’s an honor to see these amazingly talented artists do what they do best. Act I of La Bayadere (which means ‘the dancer’ and as far as I can tell is pronounced Buy-Uh-Dare) begins with Nikiya, a beautiful temple dancer performing at the ritual of fire. The High Brahmin (a high priest-type in the tradition of Jaffar in Aladin) wants Nikiya all for himself, but her heart belongs to the heroic warrior/captain of the guard Solor. Brahmin witnesses the two as they pledge their eternal love to one another. At the palace, the Rajah thinks Solor is so awesome, that he commands Solor to wed the princess Gamzatti. Solor cannot refuse. The High Brahmin tells the Rajah of Solor and Nikiya’s affair, hoping that the infuriated Rajah will put Solor to death. But his plan backfires and the Rajah instead orders Nikiya killed. At the grand engagement soirée, Nikiya is asked to perform. While dancing, she is given a basket of flowers. Thinking they are from Solor, she holds them to her heart. A serpent springs forth, bites her and she drops dead. Act II is an extended dream sequence in which a distraught Solor gets stoned and dreams of his beloved. Thanks to an informative article in the playbill, I learned that this sequence is called the “Kingdom of Shades” and is a sort of litmus test for how good a corp de ballet is. The choreography is so exacting and precise that everyone must be in perfect synchronization for the desired artistic effect. It’s pretty breathtaking. I’ve certainly never seen anything quite like it, so I definitely give props to the women in the corp de ballet. You ladies rock! Act III wraps things up quickly with the wedding of Solor and Gamzatti. As they are about to say their “I do’s” the Gods smite them, destroying the temple and killing everybody. Solor and Nikiya are reunited in heaven. I have too say that I really got off on all the pageantry and destruction in this sequence, it was like an old Cecil B. DeMille epic! Paloma Herrera danced the role of Nikiya and Cory Stearns danced Solor. Jeff and I have seen them both before (in last year’s Sleeping Beauty). We loved them then and they certainly didn’t disappoint here either. The role of Gamzatti is usually portrayed by another ABT principal dancer, but at this matinee performance soloist Stella Abrera took on this leading role. I thought she was remarkable and I’m so glad I got the chance see her in the part.